Plastic Man and the Freedom Fighters: Hilary Barta talks covers, plus behind-the-scenes looks at what we can expect from John McCrea! Artist Hilary Barta is a busy man, but he’s also a really nice guy, and recently he was kind enough to field a few quick questions about his upcoming cover work for Convergence: Plastic Man and the Freedom Fighters. Barta, of course, drew one of the best-known versions of Plas in the 1988-89 Plastic Man mini series (written by Phil Foglio), so it’s exciting to see him return to a character he’s so rightfully identified with. 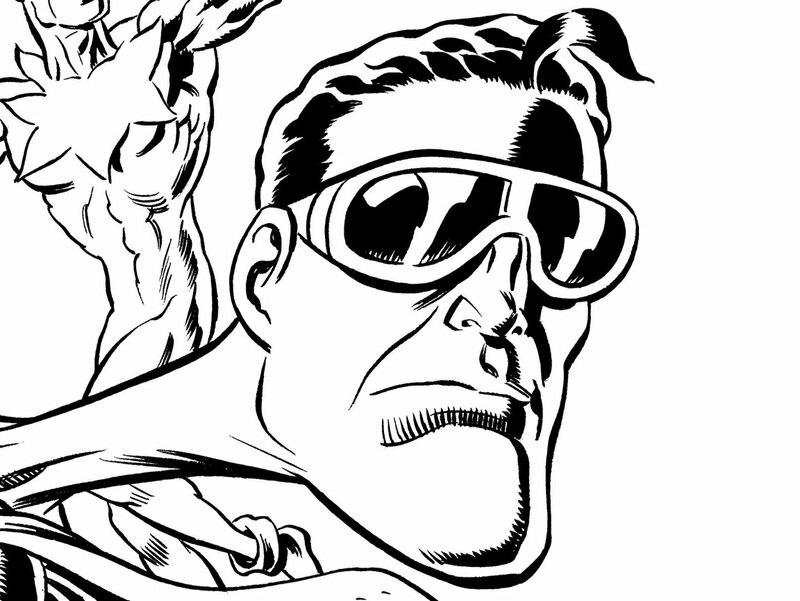 Detail from one of Barta’s upcoming covers for Plastic Man and the Freedom Fighters. How did the cover assignments come about? I was contacted by Marie Javins, the series editor, who offered me the covers. She said a “little birdie on Facebook” thought I’d want to draw Plastic Man. She later upgraded that to a very big birdie. But I have no idea to whom who she was alluding. How many covers will you be doing? It’s a two-issue series, and I’ve drawn both covers. What’s it like to come back to the character? I love Plas, and any chance to draw him is hard to pass up. But I’m not a superhero artist by disposition, and so the Freedom Fighters were out of my usual, cartoony comfort range. All except for Plas, of course. What are your general Impressions of the upcoming storyline? Do you think readers will be excited by Plastic Man’s return? The storyline has a connection to events in the DC continuity from a long time ago, and features a New York City under Nazi rule. I have no idea what readers will like — I never have. Series artist John McCrea is really good, and there are some action scenes with Plas stretching and such. So fans of Plas might enjoy those. But this is not a Jack Cole inspired humor book. It’s a superhero action book starring Plas with other Golden Age heroes that has humorous touches. Speaking of John McCrea, the Hitman artist has been sprinkling some sneak peeks at his interior work for Plastic Man and the Freedom Fighters into his Twitter stream for a few weeks now, and it looks fantastic. McCrea seems to have done a good job giving the setting a certain feel, a sense of what a world living under Nazi rule would look like, with just the right amount of grit and undercurrent of menace to give the idea of an underground resistance weight. It also looks like there’ll be plenty of Nazi-busting action, which I whole-heartedly endorse. That said, this might be my favorite image so far. Because of course Plastic Man would learn tai chi from the monks who saved him! I don’t know if that was McCrea’s idea or writer Simon Oliver’s, but it’s so perfect I can’t believe no one thought of it before. 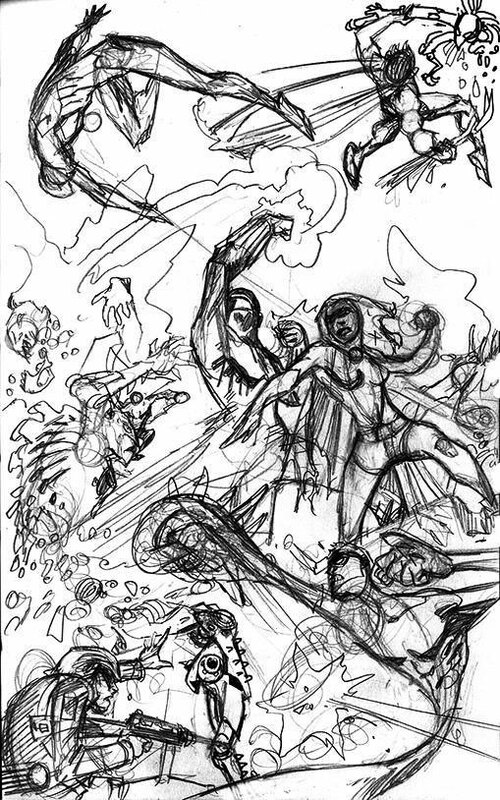 Here’s a rough sketch of a crazy-kinetic fight scene, with Plas in the bottom-right corner. And can I just say that The Human Bomb has one of the simplest and best costume designs ever? This is a gorgeous rendering of what I’m guessing is Rest-Haven, the mountain retreat where monks care for and rehabilitate the acid-doused Eel O’Brian. ; I especially like what looks like a nod to Bhutanese architecture. I wouldn’t mind having this framed and hanging on my wall — it’s just beautiful. And finally, here are a couple of finished panels, with colors by John Kalisz! Man! Between Barta’s covers and McCrea’s interiors, it looks like there’s going to be a lot to look forward to once the first issue drop on April 29! Only 94 days to go! Great to hear from Mr. Barta! This is so cool that DC had him come back for this and to do Plastic Man again. Now all DC needs to do is get Ramona Fradon back on Aquaman! Can you imagine?! That would be so great, and such a nice acknowledgment of Fradon’s history with Aquaman.